Under its enabling legislation, the Ministère des Relations internationales et de la Francophonie (MRIF) is charged with coordinating the Government of Québec’s actions abroad. This is why, in cooperation with other government departments and agencies, it is responsible for tackling key government priorities such as the Plan Nord, the Maritime Strategy, transportation electrification, and the promotion of educational opportunities as well as digital technology and artificial intelligence. To this end, through its network of offices located around the world, MRIF allocates the resources required to achieve the objectives of these priorities. For several years now, the Government of Québec has been committed to transportation electrification with an eye to environmental and economic considerations. On October 9, 2015, the Government of Québec unveiled its 2015-2020 Transportation Electrification Action Plan. As a complement to the Action Plan, the government adopted, on April 17, 2018, its 2030 Sustainable Mobility Policy. This Policy, as well as the associated Action Plan, are powerful drivers of growth and development for all related industrial sectors. As a result, a variety of programs and measures have been implemented to encourage the electrification of individual, public and freight transportation in Québec. This field offers a host of avenues for scientific cooperation, the export of Québec know-how and business opportunities for foreign investors. Several government departments and agencies are involved in this government priority, which is coordinated by the Ministère des Transports, de la Mobilité durable et de l’Électrification des transports, once again testifying to Québec leadership in the fight against climate change. For more information, visit www.transportselectriques.gouv.qc.ca. On December 13, 2017, the Government of Québec launched the Québec Digital Strategy. The goal of this forward-looking strategy is to promote coherent government actions aimed at ramping up the development of a veritable digital culture in all sectors of Québec society. 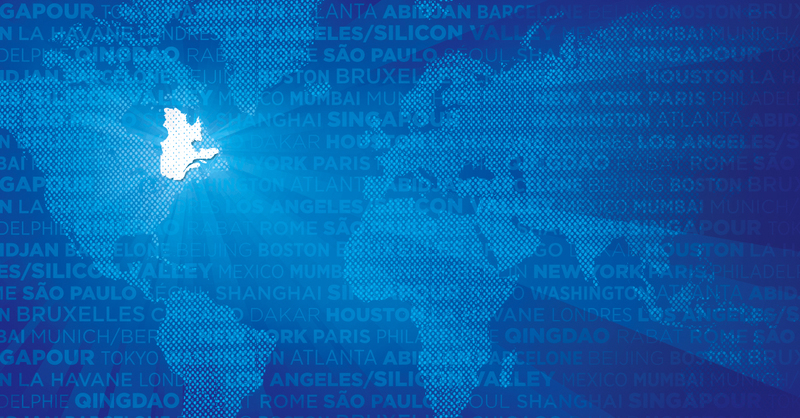 The prospects for Québec digital company growth on the international scene are considerable. However, in order to capture new markets and strengthen its position as a world leader, Québec must maintain its promotional efforts, notably by building a strong, shared brand image that emphasizes our strengths and raises the visibility of the sector worldwide. Québec is also recognized on the international scene for its strength in the field of artificial intelligence (AI). The development of AI is contributing to the advancement of Québec through the attraction of investments and talent, as well as the creation of international collaborative partnerships. The Plan Nord reflects the Government of Québec’s ambition to implement one of the largest sustainable development projects in the world. Mindful of the need to combine economic, social and environmental interests, the goal of the Plan Nord is to provide outstanding business opportunities and, at the same time, enhance the development and well-being of local communities, including the First Nations and the Inuit. The Plan Nord applies to all the territory north of the 49th parallel, an area covering nearly 1.2 million square kilometres. The Plan Nord offers foreign companies and investors numerous opportunities in a broad range of sectors (mining, renewable energies, etc. ), opportunities that include the social, cultural, environmental and tourism aspects. Developed and implemented in collaboration with local communities and based on the principles of sustainable development, the Plan Nord aims to become an international reference in sustainable northern development. With a view to increasing scientific knowledge and its application in the territory covered by the Plan Nord, the Government of Québec provides support for the Institut nordique du Québec (INQ). This research partnership is unprecedented in the university community. For more information, visit the Plan Nord website. Attracting international students is a priority for the Government of Québec. Québec’s educational opportunities are characterized by a number of distinctive features. The quality of teaching and state-of-the art equipment contribute to the excellent reputation of Québec’s educational institutions. Québec is also an ideal place to study, in particular because of its quality of life and affordable cost of living compared to many American and European study destinations. Québec educational institutions offer a broad range of programs at all levels of education. These programs are outward-looking and meet the most stringent international requirements and standards of excellence. The mightiest of our waterways, the St. Lawrence River offers unique development opportunities for all regions of Québec. The Maritime Strategy, which was launched in June 2015, provides for investments in maritime infrastructure and services for companies in order to position Québec as a world player in maritime transportation and related services. It will enable companies to be part of a high value-added logistical process through the development of intermodal transportation hubs and special access to North American markets. The government also wishes to foster the development of knowledge in the maritime sector and encourage international partnerships. Lastly, Québec will become a destination of choice for international cruises with the modernization of the port facilities in Québec City and Montréal. For more information, visit the Maritime Strategy website.